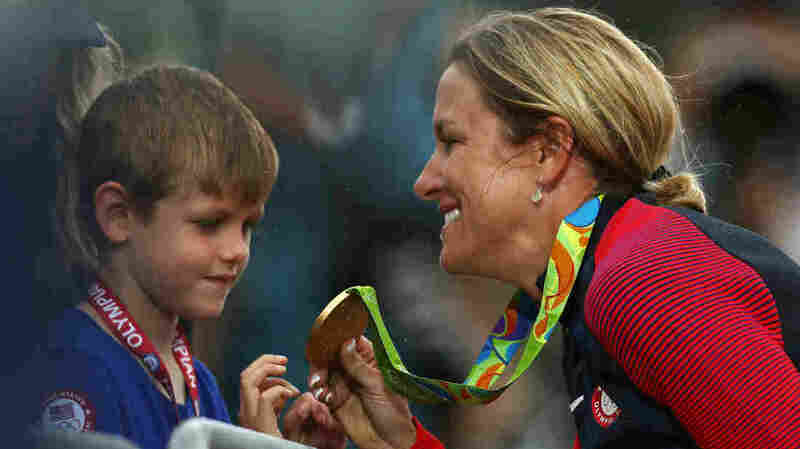 'Because I Can': Cyclist Kristin Armstrong Wins Third Gold Medal At Age 42 : The Torch "For all the moms out there, I hope that this was a very inspiring day," Armstrong said after winning her race and making Olympic history in Rio de Janeiro. Time trial champion Kristin Armstrong of the U.S. calls her life as a working mom the "secret weapon" that helped her win Olympic gold Wednesday. Cyclist Kristin Armstrong has a regular job and a son. And as of today, she also has three Olympic gold medals. After becoming the only cyclist — male or female — to win three consecutive golds in the same discipline, Armstrong, who turns 43 Thursday, said she hopes to inspire other moms. After calling this victory at Rio's Summer Olympics "the most gratifying" of her three individual championships, Armstrong urged other female athletes not to let negative ideas seep into their minds about what they're capable of. "I think that for so long we've been told that we should be finished at a certain age. And I think that there's a lot of athletes out there that are actually showing that that's not true. "For all the moms out there, I hope that this was a very inspiring day." "Working at a great hospital in Boise, Idaho, and being a mom has been my secret weapon. It provides me balance and it keeps me on track and it keeps me super focused." Focus is always important in a time trial, but on Thursday, it was as much about survival as success: While yesterday's sunny weather would have been ideal for a ride, conditions turned nasty overnight, with a soaking rain forcing Armstrong and the other riders — who start time trials at intervals and ride without any teammates — to deal with slippery road conditions on a hilly, technical course. Armstrong said she relied on her experience today to average nearly 25 mph over the course. She was close to the lead throughout — but she said she found another burst of energy toward the end, when her coach radioed to tell her, "You're in the medals. Now it's up to you what color you want to bring home." As Armstrong recalled, "That hit me really hard. All of a sudden, I think my speed went from about 48 km an hour [nearly 30 mph] to 53 km an hour [nearly 33 mph]." Kristin Armstrong and her family live in Idaho, where she works at a hospital and trains when she finds time to ride her bike. After today's race, Armstrong told reporters that she has repeatedly faced questions about why she's come out of retirement and still wants to compete at an elite level despite her age and the several hip surgeries she underwent back in 2013. A clever answer would be nice to have, Armstrong said, but she adds that she has only one reply: "Because I can." As for her job, Armstrong works at St. Luke's hospital in Boise, where she's the director of community health. She was allowed to cut her hours down to 16 hours a week last fall, she said, so her family's health insurance would remain in effect while she trained for the Rio Summer Games. Her son, Lucas, was born in 2010. Armstrong said she spends her days working with nonprofit groups, bridging a gap between physicians and disease prevention programs. "It's a dream job," she said. "I love it."